Links I’m Loving: Thankful pumpkins, turkey place cards, and more! I have some fun Thanksgiving finds for you this week, plus some lovely party ideas, crafts, and best of all… “What Does the Fox Say?” cookies (because that song won’t get out of my head and now I bet it’s in yours too!). ; ) Happy weekend everyone!! Make thankful pumpkins with Eclectically Vintage. Make turkey feather Thanksgiving place cards with Almost Makes Perfect. 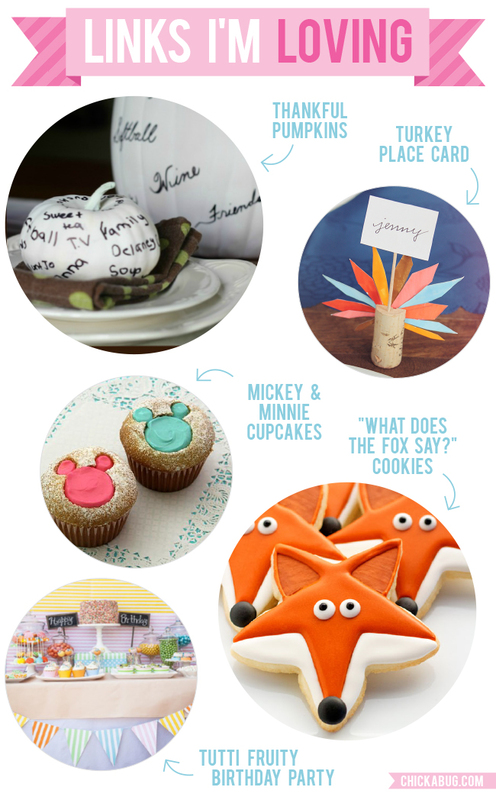 Decorate “What Does the Fox Say?” cookies (heehee!) with The Bearfoot Baker. Make adorable Mickey and Minnie stencil cupcakes with Spoonful. A bright and cheerful tutti fruity birthday party at Kara’s Party Ideas. 20 ways to fill your child’s love tank on their birthday at The House of Hendrix. Make knuckle print pumpkins with Mom Trusted. 32 easy DIY Thanksgiving crafts kids can make at Woohome. Check out a unique collection of bookends at Cool Mom Picks. A lovely vintage Santa party at Kara’s Party Ideas. 65+ Thanksgiving side dishes at Shugary Sweets. 50 delicious cookie recipes at Shari’s Berries. Download a free printable Thanksgiving door hanger here at Chickabug. Christmas water bottle labels and return address labels for your Christmas cards. Penguin theme goodies (cute for an ice skating party)! Construction theme water bottle labels. Hi Heather! I LOVE your blog! You always have cute and creative things. I am always excited to see what is going on over here at Chickabug. It was a happy suprise to see my fox cookies today. Thank you so much for adding them to one of your amazing collections. You just made my day! Have a great weekend.